Don’t you just love it when someone you like, a company or a person, contacts you? Acknowledges that you exist? I sure do. I recently got an email from Williams-Sonoma and they asked me to participate in their Smoothie Week. The email could just say “hi” and that would totally make my day, but they gave me a challenge I couldn’t refuse. I love smoothies and I love a good challenge. Smoothie week is all about crazy smoothies, smoothies with a weird ingredient or made with an interesting technique. I think with smoothies we can have as many combinations as there are people. The list of recipes is just endless, because we all have our own preferences. I thought a lot about the “weird” ingredients and came to the conclusion that what we consider weird is still very subjective. I may like something you don’t and that would be a weird ingredient. But because we’re in the middle of this great season called fall, my mind immediately went to chestnuts. I love roasted chestnuts. I wait all year for them and can’t wait to see all the stands fill the streets, where I can get fresh roasted chestnuts any minute. 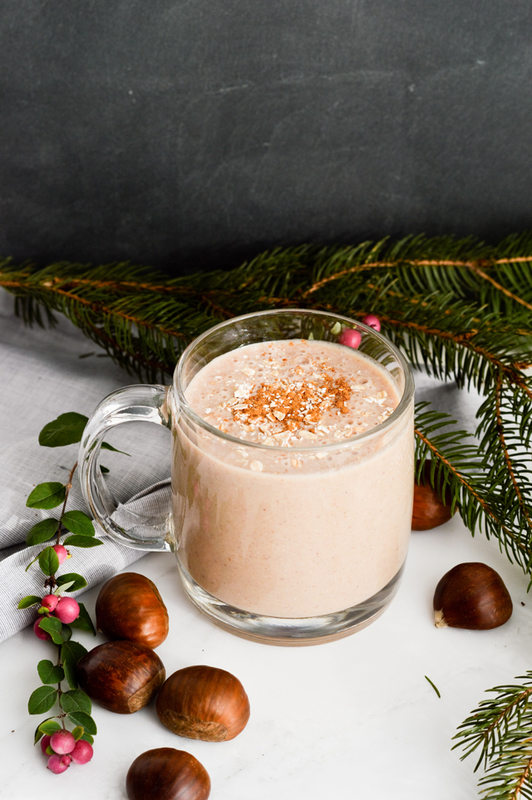 But chestnuts in a smoothie? I’ve never tried that before. I wasn’t even sure I wanted to do it and waste perfectly fine ingredients for a smoothie I might hate in the end. But I tried it anyway. And I’m glad I did, because I got this wonderful chestnut choco oats smoothie. I bought roasted and peeled packaged chestnuts and they taste really good. I think freshly roasted would work too, but the store-bought are more convenient. 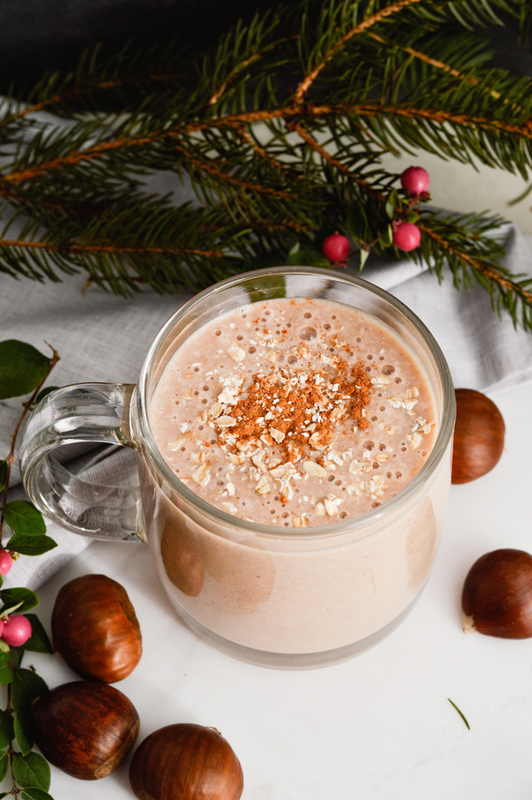 The mix of chestnuts, milk, raw cacao and cinnamon is so, so good; the banana and oats add texture and thickness, the honey adds sweetness and they all make this smoothie such a fall and winter treat. I would ideally drink this after an early morning walk in the woods, wrapped in a blanket while I sit by the fire. Dreamy! Recipe makes 1 large smoothie. First grind the oats. 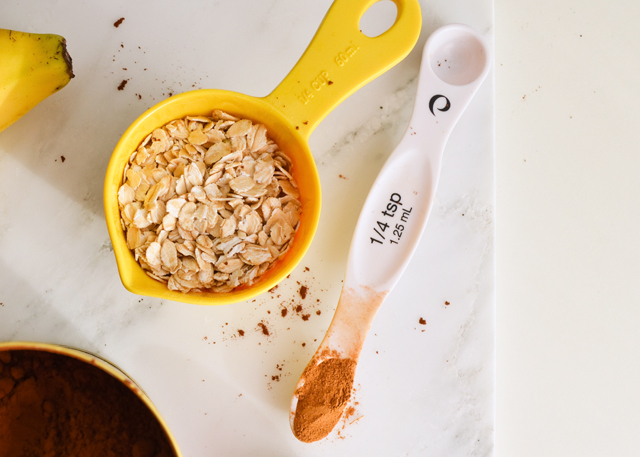 Put oats in a blender and blend on maximum speed until they turn into powder. Pour in milk and blend until incorporated. Add remaining ingredients and blend until smooth. 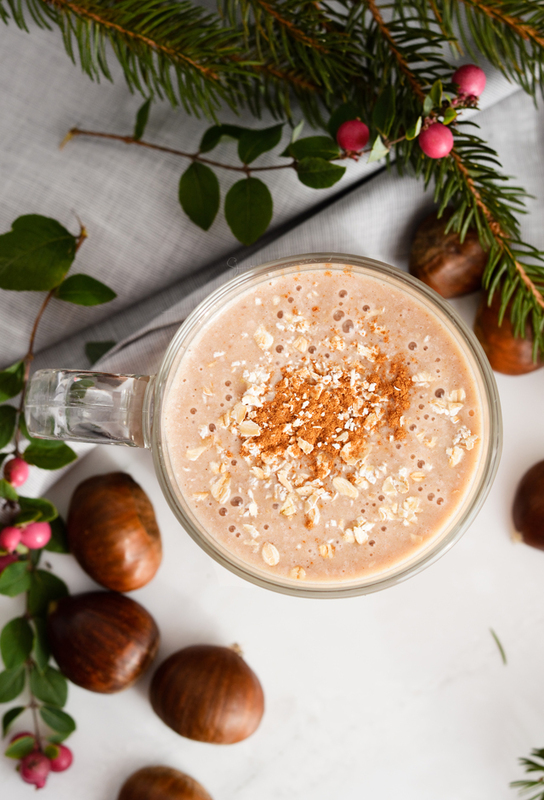 Pour smoothie in a glass, sprinkle with more cinnamon and oats, if desired. Make vegan: use milk of plant origin. I think almond milk would work great. What a wonderful idea! A few weeks back one of the local farmers (from whom I buy eggs) let me pick a bunch of chestnuts that had fallen. I picked so many though, that sadly I wasn’t able to use them all in time. I sure did enjoy the freshly roasted ones! 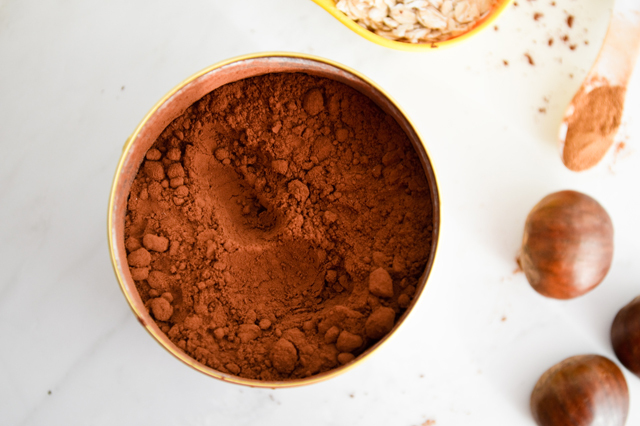 Next time I visit and pick up more I’ll have to keep this recipe in mind! I love chestnuts and this recipe is very tasty thanks. Oh man…. this is a genius idea! I’ve actually never cooked with chestnuts before, but have been thinking about giving it a whirl this holiday season. Thanks for the inspiration! Thanks Trish! You should definitely give it a try. Chestnuts also work in desserts or with green vegetables. OMG, I need to try this next time chestnuts are in season! Let me know if/when you do!